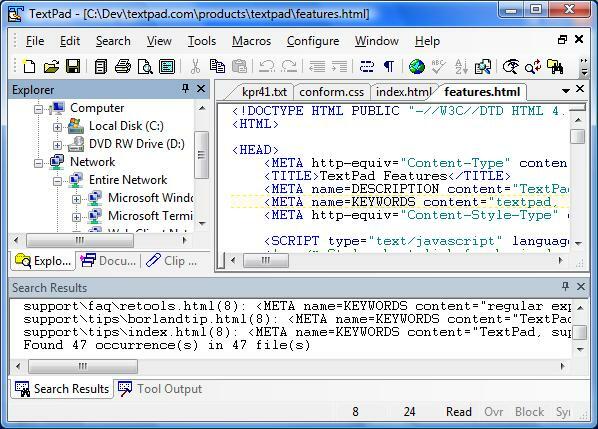 TextPad is designed to provide the power and functionality to satisfy the most demanding text editing requirements. It can edit files up to the limits of virtual memory, and it will work with the 32-bit and 64-bit editions of Windows 2000, Server 2003, XP and Vista. TextPad has been implemented according to the Windows XP user interface guidelines, so great attention has been paid to making it easy for both beginners and experienced users. ...... In-context help is available for all commands, and in-context menus pop-up with the right mouse button. The Windows multiple document interface allows multiple files to be edited simultaneously, with up to 2 views on each file. Text can be dragged and dropped between files. Qweas is providing links to TextPad 6.0 as a courtesy, and makes no representations regarding TextPad or any other applications or any information related thereto. Any questions, complaints or claims regarding this application TextPad 6.0 must be directed to the appropriate software vendor. You may click the publisher link of TextPad on the top of this page to get more details about the vendor.